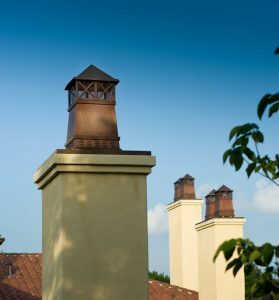 Since 2004 European Copper Chimney Pots have graced thousands of homes and businesses worldwide. Designed by legendary architect Jack Arnold to solve an architectural detail overlooked up until then. Our pots cover all the bases with form, fashion, and function. A copper chimney pot dramatically improves the drafting of a fireplace. Is engineered to withstand a 10 feet snow load and certified to sustain hurricane force winds. U.L. Listed and International Building Code compliant, our pots are compatible with both masonry and steel fireplace systems. Made from the finest copper and stainless steel a Chimney Pot keeps out pests and water while taking curb appeal to a higher level. Remember…only 1% of all people who see a home ever go inside but 100% see the outside. European Copper Chimney Pots are Hurricane Proof!